The Purifying Energy of Cats | Law of Attraction Plus: The Secret revealed! The same way dogs are our guardians in the physical world, cats are our protectors in the energy world. Know more about the power of these animals! Cats have a connection with the magical world, invisible. During the time the cat is awake, it "cleans" your house from intruding energy. When it is sleeping, it filters and transforms this energy. 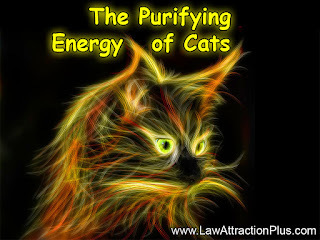 Many times, cats can be in places with low circulation of vital Chi energy just to activate this area. A lot of times cats just stare into space, totally focused...it can surely see things we can't, from microscopic life to beings from other dimensions. Many times your cat goes to an isolated place of the house and he starts to meow, it is not just looking for attention, it's some sort of alert our cat is giving us: the quality of energy of that place needs to improve. Our problems and our daily stress are absorbed by our cat. When it is too much and the place is charged with negative energy, it's not unusual for the cat to get sick. Of course cats aren't the only responsible for the energy balance of the house, but they try pretty hard. The more harmony there is in its ambient, the less negative energy the cat will need to filter and consequently it will be happier and healthier. When we sleep, our astral bodies separate from our physical bodies and go to a fifth dimension, a dimension without time and space: the dimension we are at when we sleep. Due to lack of training and preparation, most of the times we don't see this dimension just like it is, instead we "disguise" it and encode it as our psychic and unconscious content. Cats many times join us in these astral journeys or protect our astral body, besides of guarding our bedroom from unwanted spirits while we're sleeping. This is why they like to sleep with us in our beds. Pay attention to the way your cat reacts to visitors in your house. Many times they're trying to protect you from a negative or heavy energy field. Cats also monitor our evolution. During the time they live with us, they transmit information to the higher dimensions, serving as radars and transmitters. On top of that, as energy transformers they help us heal, playing a similar role of that of crystals. Cats are teachers; they teach us how to love. A free love, not submissive, respectful towards other's free will and differences. That's why it is very difficult for some people to live with cats and find them selfish. First, you must win the cat's trust. Then, you must learn to respect them. It will show you affection when it really is prepared and not when you demand it. Cats reflect love. From the energy point of view, people with allergies to cats are people who have a hard time letting love come into their lives. If there are many members in the family and only one cat, it could be weighed down absorbing everyone’s negativity. It's a good idea to have more than one cat so the charge can be divided between them, especially in those cases. If you don't have a cat, and suddenly one comes into your life, it is because you need a cat in a specific time of your life. The cat is trying to help you. If you can't take him, it is important that you find it a home. The cat came to you from some reason you can't understand on a physical level, but you can find out in your dreams. Do you have a cat as a family member? Do you see any of these qualities in it?